HEAT ILLNESSES CAN BE FATAL: Would You Know What to Do? Did you know your body is constantly in a struggle to disperse the heat it produces? Most of the time, you’re hardly aware of it – unless your body is exposed to more heat than it can handle. In 2013, 372 people died in the U.S. from exposure to excessive heat, according to Injury Facts 2016, the annual statistical report on unintentional injuries produced by the National Safety Council. Heat-related illnesses can escalate rapidly, leading to delirium, organ damage and even death. Heatstroke can occur when the ability to sweat fails and body temperature rises quickly. The brain and vital organs are effectively “cooked” as body temperature rises to a dangerous level in a matter of minutes. Heatstroke is often fatal, and those who do survive may have permanent damage to their organs. Someone experiencing heatstroke will have extremely hot skin, and an altered mental state, ranging from slight confusion to coma. Seizures also can result. Ridding the body of excess heat is crucial for survival. When the body loses an excessive amount of salt and water, heat exhaustion can set in. People who work outdoors and athletes are particularly susceptible. Symptoms are similar to those of the flu and can include severe thirst, fatigue, headache, nausea, vomiting and, sometimes, diarrhea. Other symptoms include profuse sweating, clammy or pale skin, dizziness, rapid pulse and normal or slightly elevated body temperature. Uncontrolled heat exhaustion can evolve into heatstroke, so make sure to treat the victim quickly. Heat cramps are muscle spasms that usually affect the legs or abdominal muscles, often after physical activity. Excessive sweating reduces salt levels in the body, which can result in heat cramps. Sit or lie down in the shade. Drink cool water or a sports drink. Seek medical attention if you have heart problems or if the cramps don’t get better in an hour. Never leave a living thing unattended in a motor vehicle! Heat related motor vehicle emergencies are entirely preventable, see below for ways to keep your loved ones safe. For other ways to help keep your family, friends, and pets safe this summer download our Hyperthermia brochure (English version or Spanish version) for lifesaving information. Never leave children or an elderly person unattended in the car, even to run a quick errand. A child’s body can heat up five times faster than an adult’s and even in cooler weather, cars can heat up to dangerous temperatures very quickly. In as little as three minutes in the sun, a car’s interior temperatures can heat up from 78 to 100 degrees, putting your loved ones in danger of hyperthermia or heatstroke. 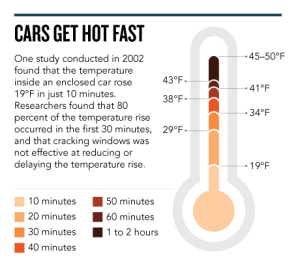 On a mild day, the temperature inside a car can rise 20 degrees above the outside temperature in just 10 minutes or less. Make a habit of checking your vehicle before leaving it. Look before you lock! When a child is missing, check vehicles and car trunks early in your search. Keep vehicles locked at all times even in the garage or the driveway to ensure kids don’t get in on their own. Keep car keys and/or keyless remote openers out of the reach of children. If you ever see a child or an elderly person alone in a car, get involved. If they are hot or seem sick get them out as quickly as possible. Call 9-1-1 or your local emergency number immediately! Never leave pets unattended in the car, even to run a quick errand. Pets can suffer serious injuries when left in a hot car for only 15 minutes. Keep in mind that pets maintain a higher body temperature than humans and can’t cool down as efficiently. 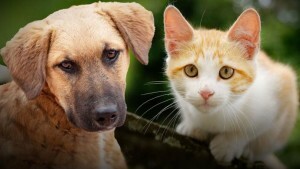 Your pet can suffer heat related injuries like hyperthermia and heatstroke. Know before you go! If you are driving to a destination where you cannot bring your pet inside with you, don’t bring them in the first place! Leaving them alone in a hot car will only put them at serious risk. At restaurants use the drive-thru when possible. A drive-thru is a great way to stay in the air-conditioned car with your pets. No drive-thru? Leave pets at home! In children, the body’s ability to maintain and regulate its core internal temperature is immaturely developed and in the elderly, the body’s temperature regulation ability can be impaired due to underlying medical conditions and medications they may be taking. Heatstroke is the leading cause of non-collision, vehicle related deaths for children. Since 1998, an average of 38 children have been killed every year by these events. 43 children in 2013. Children’s bodies’ heat up 3 to 5 times faster than an adult’s making them particularly vulnerable to these conditions. Your domestic pet can’t cool down as effectively as humans. Unlike humans, pets don’t have sweat glands over their entire body, only their noses and pads of their paws. They can only normalize their body temperatures through panting which isn’t efficient under extreme conditions. 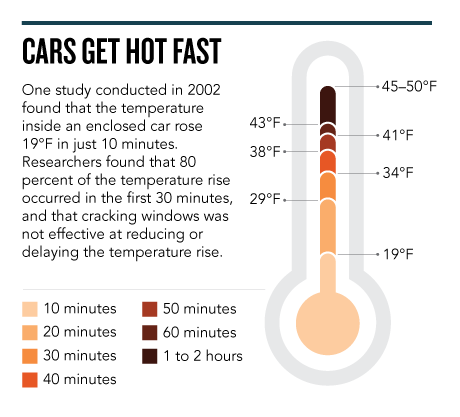 When it’s between 72 and 96 degrees outside, temperatures in enclosed vehicles can increase by 43 degrees in an hour. This entry was posted in Eldercare, Family, Heat Safety, National Safety Month, Safety, Summer, Well-being. Bookmark the permalink.